Welcome back to Apple Week! Yesterday there was a little break from all things apple for a Monsters University and Visa Gift Card giveaway. Don't forget to go and enter yourself!! Now we are back for this Apple-tastic week. In years past, we have used everything from plastic grocery bags, plastic storage totes, our shirts, and/or strollers to gather our picked apples. Nothing fancy, but it always got the job done. 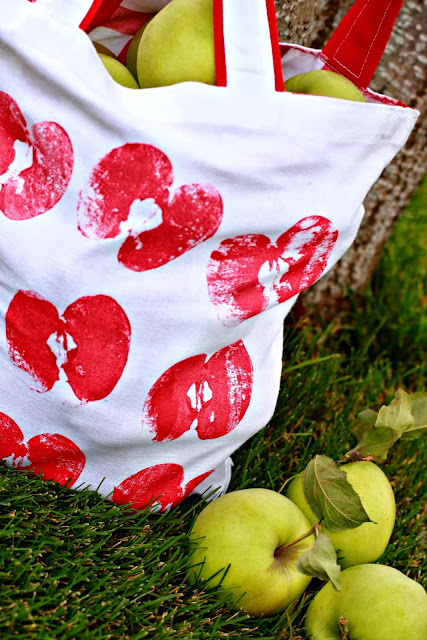 This year I wanted to make an apple picking bag that was a little more fun and a little more lovely. This bag was SUPER easy to make. Basically I upgraded an already made white canvas tote. You know the ones you get in packs of three from craft stores. 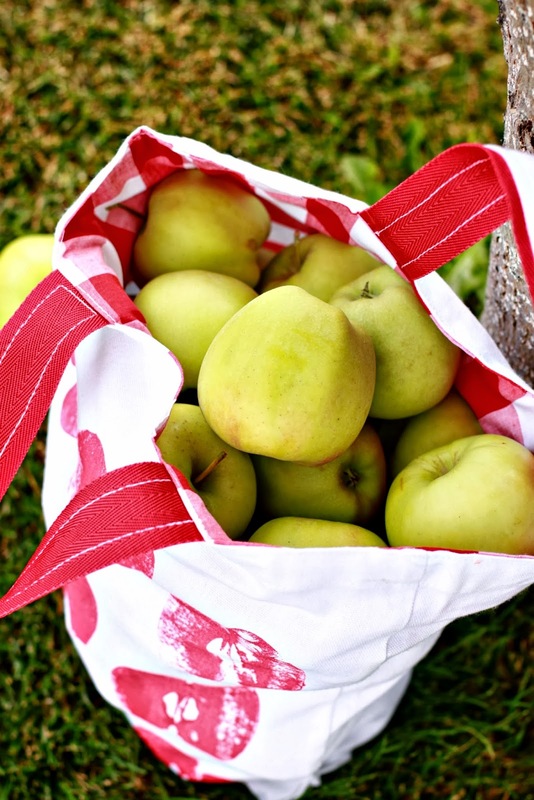 Yep, this apple picking tote started out as one of those plain Jane bags. Slip a small stack of newspapers inside the bag to keep the paint from bleeding through. 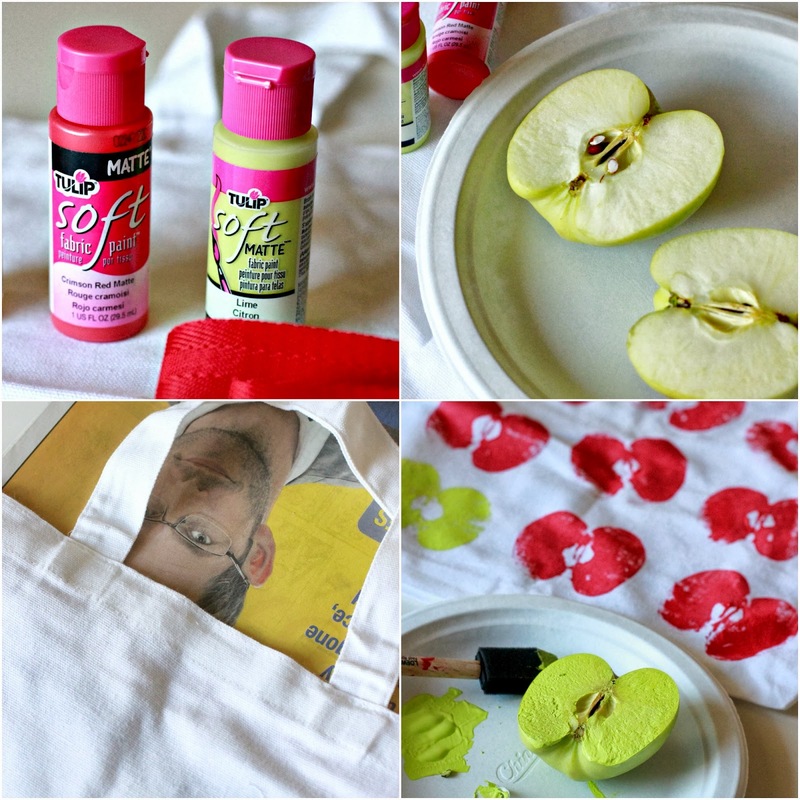 Apply red paint to one half of the apple with a craft brush. Use the apple as a stamp. Firmly pressing the paint-covered apple where you want it. Repeat each time you stamp. I chose to do rows of three by three. I did more of a randomly placed pattern (aka not perfectly straight). Your kids could totally help at this step. I did nine red apples and one green. You could do any combo you wanted. Allow the paint to dry for about 2 hours, or bring out a hair dryer and speed up the process (which is what I do because I am SUPER DUPER impatient). With your tote painted, now we just have to add a few more pretties. Measure the handles, and cut two strips of belting, that will be sewn to the handles, to the same size. Measure the bag. Cut two rectangles of fabric measuring 1" wider than the width of the bag and 1 1/2" taller than the height of the bag. Pin the belting underneath the tote handle, centering the tote handle. 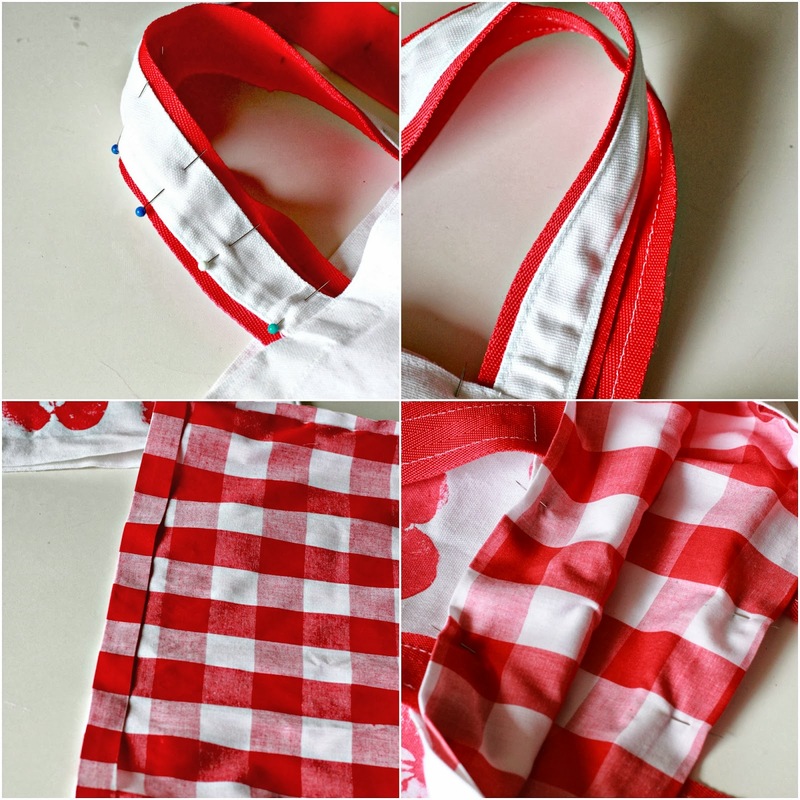 Then sew the tote handle to the red belting. Sew the rectangles of fabric together, right sides facing, down one side, across the bottom, and back up the top. Leaving the top open. Hem the top by folding down a 1/2", ironing, and folding down another 1/2" and ironing again. Turn the bag out. Insert inside the tote, wrong sides facing. 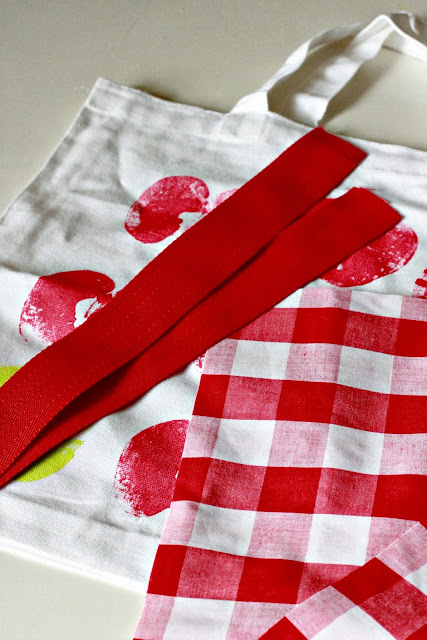 Pin the hem of the lining to the top of the canvas tote. Sew around the top securing the lining to the tote. 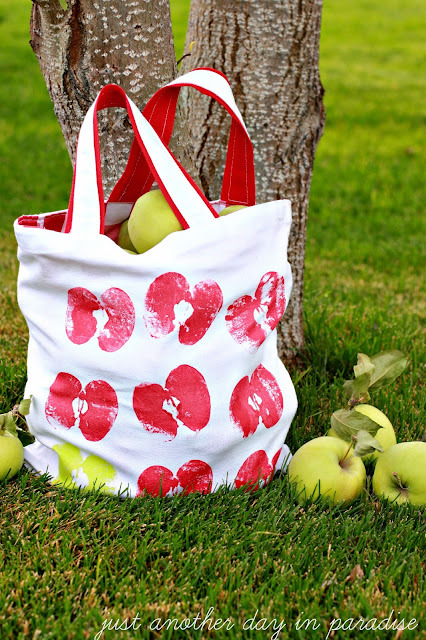 Go from a simple white tote, to a fun apple picking tote in no time! Now all you have to do is fill it with glorious and delicious apples. Hope you are enjoying Apple Week. The apple bag is simple darling! I love that you just stamped one green. It's divine. No wonder you picked so many apples, I would have too just to use the bag!